More bad news for the Broncos. Right tackle Jared Veldheer has already missed the team’s last couple of games, and now it looks like the Denver could be without their best interior lineman for the remainder of the season. The Broncos’ initial diagnosis of guard Ronald Leary is a torn Achilles, according to Adam Schefter of ESPN (Twitter link). If that’s the case, Leary will miss the rest of the season. 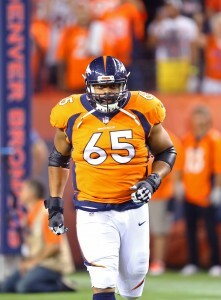 It’s a huge blow to the Broncos’ offensive line, which is already light on depth. The Broncos benched their other starting guard, Connor McGovern, ahead of the team’s loss today. McGovern and his replacement, Max Garcia, will presumably both start now moving forward. Denver has now lost four straight games after starting the season 2-0, and is in free-fall. Coach Vance Joseph has been on the hot seat seemingly since the beginning of the year, and this loss certainly won’t help him in his quest to keep his job. Leary, 29, has two years left on the four-year $36MM deal he signed with the Broncos before the 2017 season. He was a heavily sought after free agent after spending his first four seasons with the Cowboys, where he was one of the best guards in the league. He did very well and got paid. Injuries happen unfortunately and they’re never at a convenient time. I hope for a speedy recovery and the Broncos will be just fine. I think he took over for Collins at Left Guard when he was injured. But indeed he was a back up his last year in Dallas. He did play well for the Cowboys though.